Normally, we drive to Colorado for snowshoeing. Due to time constraints and distance to this locale, we decided to fly to Colorado Springs and rent a car. Crowds and security lines are minimal, yet they have everything you need in one building within easy walking distance. 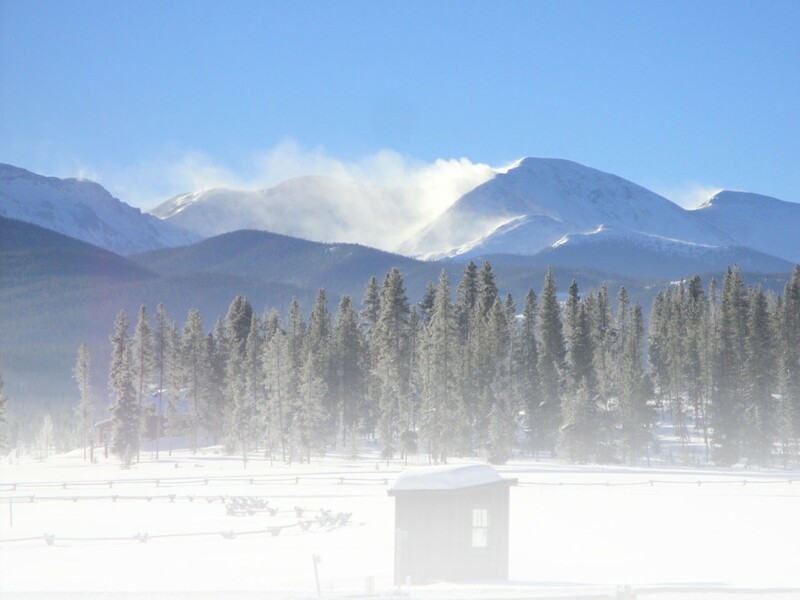 Walking down the concourse, you can’t miss a spectacular view of Pike’s Peak, as well as other snow-capped mountains dotting the horizon. We were getting excited by then. Rental car counters are directly across from baggage claim and cars are parked right outside. We had our car and were on our way within 30 minutes from deplaning. You can also fly directly to the Gunnison-Crested Butte Regional Airport. We just got a good deal to Colorado Springs and didn’t mind the drive. Driving from Colorado Springs to Crested Butte takes about four hours. Take Highway 115 South to Highway 50 and go west. Beautiful scenery makes the fairly long ride worthwhile. You enter the Arkansas River Canyon after leaving Cañon City. There are spectacular rock formations and views of cascading rapids as you parallel the picturesque Arkansas River. On previous trips, we have even spotted Bighorn Sheep, so keep your eyes open for wildlife. After exiting the canyon you go through Salida, one of our favorite Colorado towns. If you have time, drive down some of the tree-lined streets where you will see some well-maintained early 20th Century bungalows. For a good meal at a reasonable price, try the Country Bounty Restaurant, located on Highway 50 on the left heading west. The Buffalo Burgers are great. On the map, the drive from Salida to Gunnison looks like an easy, 65-mile drive. However, a “little” obstacle called Monarch Pass can, at times, be a significant challenge. The outbound trip was no problem – roads were plowed and clear. Our return trip was another story entirely, as the area had just been hit by a major snowstorm. The decision to rent an all-wheel drive vehicle proved to be the right one. Going west, once you get to Gunnison, turn right (north) on Highway 135 for an easy 28-mile drive through the Gunnison Valley to Crested Butte. You gain about 1,100 feet in elevation, a gradual climb with no steep or winding mountain roads. Arriving mid-afternoon in Crested Butte left time to explore the town with the help of Beth Buehler, Public Relations Director for the Gunnison/Crested Butte Tourism Association. Beth took us around the small but charming town that is inhabited by only a little less than 1,500 permanent residents. The entire Crested Butte area has a population of about 3,800. Of course, this number swells during the winter and summer tourist seasons. Our only previous visit to Crested Butte was in the summer, about twenty years ago. That is too long to go between visits. Crested Butte has many excellent examples of Victorian architecture. For you history buffs, be sure to visit the Crested Butte Mountain Heritage Museum, located in the middle of the town in a building that opened as a hardware store in 1883. Exhibits chronicle Crested Butte’s history as a mining and ranching community. Included in a nominal fee, you get a brochure mapping out a walking tour of the town. For more information, go to http://ww.GunnisonCrestedButte.com. If you’re looking for chain establishments for food or lodging, you won’t find them here. That’s part of the attraction for many visitors. Lodging runs the gamut from small hotels and inns to cabins and B&Bs.